After Dylan's triumphant debut at the Newport Folk Festival in July 1963, Joan Baez introduced him to her fans as a surprise guest during a fall concert tour. 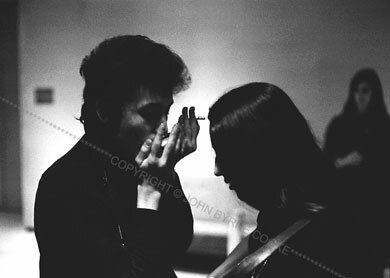 A year later, it was Bob's turn to bring Joan onstage with him, as his fame began to surpass hers. Here, they are rehearsing together backstage at Philharmonic Hall (later renamed Avery Fisher Hall) at New York's Lincoln Center, where Bob sold out the house.